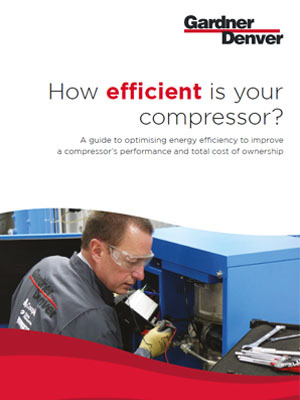 What useful information will you find in our new Guide to Compressor Energy Efficiency? An introduction to compressed air and the impact that improving energy efficiency can have on your system’s performance. How sizing and specifying a compressor correctly can dramatically cut lifetime costs. Energy audits – discover where energy and money are being wasted. Other opportunities for improving productivity, safeguarding product quality and reducing site downtime. How the Fourth Industrial Revolution is transforming compressor efficiency. An introduction to iConn™ - Gardner Denver’s revolutionary cloud-based air management platform. Get a copy of the Guide now and check in which areas you can still find opportunities for boosting your system’s performance!